Vinay Sitapati is a political scientist, journalist and lawyer. He teaches at Ashoka University and writes for the Indian Express. He has studied at Rishi Valley school, National Law School, Bangalore, and Harvard University, and is finishing his PhD in politics from Princeton. 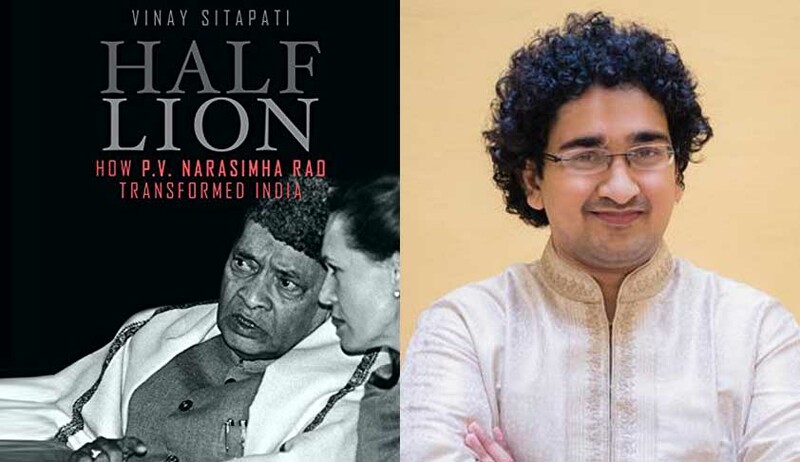 He answered a few questions about his just-released book, “Half Lion: How P.V.Narasimha Rao transformed India” (Penguin Random House, 2016) in this interview to Livelaw. Q: From being a student of law, to a biographer of a PM? How did this sudden transition take place? A: After studying law at NLS-Bangalore and Harvard, I worked as a political journalist with Indian Express. For the last five years, I have been pursuing a PhD in political science at Princeton. So the transition has been a while in the making. I now write on politics, while continuing to research and write on legal issues. Q: Who suggested your subject first? How did you become interested in the subject? A: I grew up in Bandra in Mumbai. I remember the changes of the 1990s, and like millions of Indians, I too am a child of liberalisation. I always wondered if there was a larger story there. Then, two years ago, I read the book Deng Xiaoping and the Transformation of China by the Harvard historian Ezra Vogel. It was the story of China changing in the 1980s, along with the story of the man who did it. I knew then that there was a book waiting to be written about India changing in the 1990s, and the man at the political helm. Q: Was it a full-time affair while researching and writing the book? Or, were you simultaneously researching for your Ph.D as well? A: I worked full time on the Narasimha Rao book from April 1st 2015 to April 10th 2016, when I submitted the final draft to my publisher, Penguin. I don’t think I would have been able to write this kind of book without completely immersing myself. Luckily my Princeton advisors were supportive of this book project. One of them, Atul Kohli, even read draft chapters. The book could not have been written without his help. Q: A reader of your book gets the impression that you revealed much less of what you might have come across while getting access to Rao's private papers. So, is there another book in the offing? A: Another book is not in the offing. But yes, I revealed less than what I knew. This is mainly because a scholarly book like this is not about what I know, but only what I can prove. Where I did not have evidence to back up an assertion, I left it out of the book. I was also very careful when writing the nuclear chapter, for reasons of national security. I knew more than I could write. Q. How often Rao wrote his daily diary? Did he have a biographer like you in mind while writing it? A: Rao’s diary is sporadic. It’s detailed when he is out of power. But once he becomes PM and gets busy, he has less time, so the diary tends to be more cursory. I don’t think he kept a diary for any future biographer. He was a lonely, introspective man. He kept a diary to reflect on his own thoughts. It helped him clarify his ideas to himself. He was that kind of man. Q. Your book suggests as if you knew your subject intimately, whereas you might not have even seen him, or interacted with him during his lifetime. How did you achieve this? A: I never met Rao. I was only eight years old when he became prime minister! I am also not Telugu-speaking, and have no personal link with Rao’s family or those close to him. I think that’s one of the strengths of the book. I did not have any personal memories or biases when I began writing the book. I was therefore able to only go where the evidence led me, without any preconceived notions. Q: More than 100 interviews, plus abundance of secondary sources on Rao. How did you organise your materials? A: It was hard. Rao left behind around 45 cartons of his private papers. Plus I read around 200 books and articles. And in addition, I interviewed more than 100 people – from Rao’s cook Rajaiah to his finance minister Manmohan Singh. When I began, I had some sense of how the chapters would look like, so I organised the materials around each of the chapters. But I did not know what each chapter would conclude; I only knew that at the end, once I had looked at the evidence. Q: The book suggests Rao also studied and practiced law. But there is nothing much one can find on this phase. What sort of cases he dealt with? Was he disappointed with the practice, because he was not making enough money? A: Rao studied law in Maharasthra, and practiced briefly, before joining the national movement. I don’t think he left practice because of lack of money; he left because his senior, Burgula Ramakrishna Rao, was a Congress politician who was also active in the freedom movement. Burgula would become the first chief minister of Hyderabad state. Rao also read up a lot on the law after he resigned as PM in 1996, and was named in multiple corruption cases. He would read chargesheets etc, and make detailed notes – originals are present today in his archives. His was certainly a detail-oriented mind. He would have made a good lawyer. Q: Your book is very candid about Rao's private affairs with women, though it leaves things for readers to infer certain things. How did his immediate family members, and the women referred to, react to it, that is, if they knew what was going to be published? A: India does not have a tradition of biographies which refer to love and relationships. For example, in S.Gopal’s landmark work on Nehru, Edwina Mountbatten finds scarce mention. I wanted to break this tradition and write candidly about Rao’s relationships. They are important to understand Rao’s political and personal loneliness. At the same time, I did not want it to be a salacious book full of sexual innuendos. That would have taken away from the substance of the book. Rao’s family has been remarkable. They never attempted to censor me in any way; never limited my ability to write – even where they disagreed with me. I also confirmed (mainly via email) the quotes of all those people I interviewed. So I have evidence to back up my assertions. Q: Rao is also very candid himself about corruption, as something which is inevitable in running a democracy like ours. But he was realistic about it only when it concerned himself, and not others. The hawala scandal is an example, when he let his close colleagues leave the Government. But when it came to allegations against himself, he did not take any moral high ground, and managed them politically. A reader would find your book a honest appraisal of the man, though you did not elaborate how he managed the Ajit Singh affair during the no-confidence motion, when MPs loyal to Ajit Singh abstained and bailed him out. You hint that money was involved, but left it at that. Was it because people involved in the affair are still around? A. Rao was politically corrupt. The evidence is clear that he used party money to shore up his political position. The paradox is that he was personally honest, and died in debt. On the Ajit Singh affair, I found no direct evidence of corruption. So I let the circumstantial evidence I have speak for itself. If I had direct evidence, I would have written it. On the JMM bribery case, I spoke to those who had been involved in the deal. They all told me that Rao was in the loop: he knew exactly what was going on. I say that in the book. The book’s success hinges on its credibility; I was not afraid to write what I would prove. Q Both on the anti-Sikh violence, and the Babri masjid demolition, you did not spare your subject, and you tell the readers, that he could have played his role differently, so that history would have judged him differently. As a reader, one is intrigued whether his political judgment was a bit naive, because he did not assert himself when Arun Nehru (why you did not name him?) said information about the anti-Sikh violence in 1984 should directly come to the PMO and not to the Home Minister. Second, he trusted people like Advani and Kalyan Singh on their promise that no harm would come to the Babri structure in 1992. A: I do not mention that name of the person close to Rajiv Gandhi who called up home minister Rao on October 31st 1984 and asked him to back off. This is because the two home ministry officials who were in the room with Rao when he got the call did not want the name mentioned, and I want to respect the wishes of my sources. Every Congressman behaved the way Rao did: they listened to a direct order from Rajiv’s PMO to stand down. There was nothing naïve about this; Rao wanted to protect his position in the new prime minister’s durbar. Had he protested, his political career would have ended. I call it his “vilest hour”. On the Babri masjid demolition, I am much more sympathetic to Rao. The main problem was that the prime minister did not have power of the police protecting the mosque – only the UP chief minister did. The Constitution is very very clear about this. Rao had limited legal options; had he imposed article 356 – the only real action he could have taken – and dismissed Kalyan Singh, the Supreme Court might have held it illegal. This is because article 356 does not apply when law and order has not yet broken down, even if it is imminent. It is only in this circumstance – when there were few formal ways to protect the mosque – that Rao decided to believe the sangh parivar’s promise to protect the mosque on December 6, 1992. Rao made a mistake, but it was in very difficult circumstances. Also remember that nobody was explicitly asking for the dismissal of Kalyan Singh in November 1992 – not Rao’s cabinet, not Sonia Gandhi, not the Supreme Court or law ministry, not even the secular opposition. All those who today claim to have foreseen the demolition were silent before it happened. Q. So, what interests you again, which may merit another book-length treatment? A: My next project is the conversion of my PhD dissertation into an academic book. But I do hope to write another political biography some day. It won’t be easy. What made Half-Lion special was that my subject was not just consequential; he was introspective and kept a paper trail. It’s not going to be easy to find another Indian political leader who was both reflective as well as kept documentary evidence of his reflections. I’ve been lucky once; I may not be this lucky again.